Curtain Jerker 2/27/13: Best WM Ever - WrestleCrap - The Very Worst of Pro Wrestling! Another straight forward one: what is the greatest WrestleMania of all time, and why? 16 Responses to "Curtain Jerker 2/27/13: Best WM Ever"
I personally think WM 5 was the greatest WrestleMania of all time. Haku vs. Hercules was a great opening match, Perfect vs. Blue Blazer rocked the house, The Brain Busters (no more needs to be said), Hogan vs. Savage was good, and the fodder matches were short and gone. I’d go with WrestleMania III, but I’m biased being from Detroit. As such, 23 comes second, as I was there! Third for me would be XIX. There is some slight bias in that one too, as my brother lived in Seattle at the time. I did not fly out to attend though, and I regret not doing so. I’m in total agreement with WMV also. Truly the golden age of the WWF, with such fare as Ronnie Garvin vs Dino Bravo and Andre vs Jake Roberts tearing down Trump Plaza Hotel and Casino. I watched the edited Coliseum home video of this on a daily basis. It was also Jesse Ventura’s best performance on a WWF broadcast, as he ripped into Hogan without mercy. Rick Rude’s victory over the Ultimate Warrior was a moment to savor for heel fans, who were starved of rulebreaker success in that era. What a grand event. WM IX, as we are on wrestlecrap. but in reality, WM X was great. I’m torn between X7 and XIX as both shows were stacked cards. X7 was the pinnacle of the Attitude era and the company was firing on all cylinders. Of course it would all come crashing down with the horribly botched Invasion angle. But on April 1, 2001 the WWF put on an amazing night of wrestling. 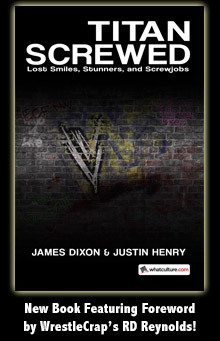 XIX on the other hand was during a time where the WWE was still trying to figure out how to survive in a post-WCW world and often the lazy booking and backstage politics got in the way of the product. But not on March 30, 2003. That year’s WrestleMania is possibly the most stacked show in the company’s history. Angle vs. Lesnar, HBK vs. Jericho, Rock vs. Austin III, Vince vs. Hogan, HHH vs. Booker. It’s almost like five main event matches in a row. In terms of actual match quality I’d go with XIX as the greatest of all time. In terms of the company being in peak form I’d go with X7. I’d have to agree that Wrestlemania 17 and 19 were the best. The match quality and stories being told during both of these shows were amazing. Wrestlemania 2, 9 and 11 were probably the worst. I got to agree with the lot and say WM17. For me it’s actually a toss up between Wrestlemania X-Seven and XXVIII. 18-seconds aside, there were some first rate matches on last year’s card, and it was certainly the best Wrestlemania I’ve seen since X-Seven. (Even the 12-Man Tag was kinda fun to watch.) Sure, there have been good Wrestlemanias since 2001, but XXVIII is the only one I feel that lives up to the Capstone of the Attitude Era. Also, XIV is a close third. Lots of underappreciated matches on that one. Hey, I liked ‘Mania 9! I’ll go with 17 as well for the best. Tough choice…but in terms of sheer action, I’d take WrestleMania X. Short and sweet, but had good matches from beginning (best WM opener EVER) to end (one of the best WM finishes ever). Best parts (Other than Bret/Owen and Bret/Yokozuna) included Roddy Piper and Mr. Perfect as guest referees, the late Earthquake’s squash against WrestleCrap alumni Adam Bomb, and the HBK/Razor Ladder Match. Easily one of the Top 10 WrestleManias, though I’d say Top 5. I’ll go with XIX. Some truly great matches in that one. Most overrated is XII. Not that anyone picks it as the best, but nobody says it’s one of the worst either. Every year leading up to the Showcase of the Immortals, I watch every WM and this one is the biggest chore. Lousy card and a yawner of a main event. There’s got to be others that find the iron man match virtually unrewatchable. X-7 because of the kid whose favorite wrestler is the Undertaker and his favorite band is Limp Bizkit.